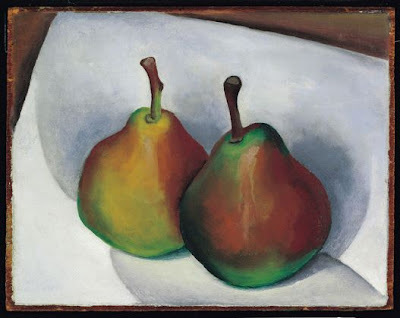 Here is a simple painting of two pears by American painter Georgia O'Keeffe (1887 - 1986). Although it's not the kind of image we usually associate with her – the close-up paintings of flowers, or images of cow skulls or Southwestern landscapes – it has the same kind of simplicity and monumental feeling as her more familiar work. Notice how she uses multiple shadows as compositional elements? They ground the pears in the white space, and they help relate the pears to the edges of the white cloth (I assume it's a cloth resting on a table). Without them, those wonderfully solid, modeled pears would float in the white space. Notice how the cloth's edges are tilted, giving the painting a dynamic feeling? O'Keeffe uses this to create strong and interesting negative spaces. There is still no doubt that those lovely pears are the focal point of the painting. Why? It's partly because the shadows lessen the contrast between the edge of the cloth and the dark table beneath it; partly because she has lightened the shadow around the pear stems, creating greater contrast between them and the white of the cloth; and partly because the shapes of the pear tops and stems are so interesting. You can see more of Georgia O'Keeffe's work, and read about her life and her homes at www.okeeffemuseum.org. Once you've determined where you want your painting's focal point to be, there are a number of ways that you can lead the eye there. Leonardo da Vinci's masterpiece, the Last Supper, painted from 1495 to 1498, illustrates several methods beautifully; we'll look at two. They are: the uses of converging lines and contrast in value (light and dark). 1. Converging lines - Notice how the lines of the room all converge, in perspective. They lead the eye in to the center, pointing to the face of Jesus - who is both the center of interest and the focal point of the painting. 2. Contrast in value (light and dark) - The eye is typically drawn to the area of greatest contrast between light and dark. 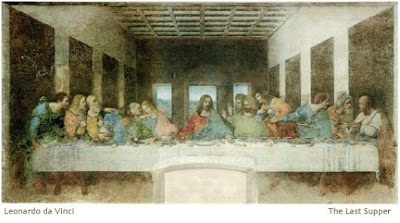 In The Last Supper, the greatest contrast is between the dark of Jesus's hair, framed by and contrasted against the white of the window behind him. This further emphasizes Jesus as the focal point. Although your eyes may scan the other figures, or other parts of the painting, your eyes will always return back to his face. How can you use this in your own painting? Ask yourself, does the painting have converging lines? If it does, do those lines take your eye where you want it to go? Then look to see where you have the greatest contrast between light and dark, side by side. Is that at your focal point? If your answers are no, they will give you clues about what to do next, in order to make it work. The focal point should be the center of interest of your painting. Consider your subject; what do you find the most interesting? Where do you want to lead your viewer's eyes? Where do you want their eyes to rest? The focal point of a painting is the place where the viewer's eye wants to go. The question is, is that where you want the viewer's eye to go? Is it the same place that you thought was the center of interest? You can test this easily by turning the painting upside down (sideways works, too, as does looking at the painting in a mirror). Looking at a painting upside down takes everything out of context. Instead of seeing objects - a tree, a river, a couch, an apple, a person - you see things in terms of shape, value (light and dark), and color. A big part of making a painting work is finding a way to lead the viewer into the painting, and to the focal point - making it the painting's center of interest. Finding your focal point is the first step. 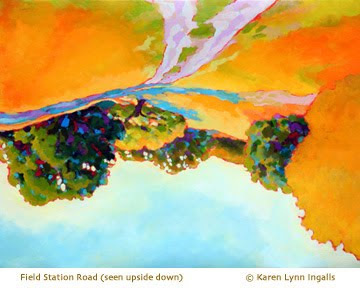 The second and last weekend of Artrails, Sonoma County's open studios program, is this weekend! You can visit artists in their studios from 10:00 to 5:00 on both Saturday and Sunday. Who to visit, with 141 artists to choose from? You can look at the Artrails directory online to see whose work interests you. We also looked last week at the work of Andy Williams, in Salinas. You can find his blog at Andy Williams Studio (if you like his work, you might want to bookmark his blog - it can be hard to find because of so many references on search engines to the singer).